Are you starting a new job in Automotive Retail Sales? Well, you started a challenging and difficult career that can be also rewarding and lucrative. It is an exciting time for you with with many things to learn. Get off to the right start. Learn some basic sales skills that will help you assist your customers in finding the right vehicle that suits their needs and in return gives you a chance to earn their business and get the sale. It is not going to be easy--if it were, everyone else would be doing it. The odds are stacked against you. However, if you persist, learn, and apply a whole lot of enthusiasm you will be a success! Managers, do you have some new recruits starting? Don't just throw them on the showroom with a brochure in their hand. Give them some basics to help them be successful. Keep in mind, your success comes from their success--not their failure. According to Automotive Career Consultants, “Studies have shown that automotive dealerships have a 76% turnover rate compared to a 12% turnover in the private sector.” Why is this number so staggering? The turnover is due to three factors. One: some sales people treat automotive sales as a job and not a career. Two: the pressures of the business becomes too much and they quit. Three: they are not trained properly and they end up failing. Mr. Northburg has completed this guide book for new Automotive Sales Consultants to address the third factor; proper training. Automotive Sales Playbook is a step by step tutorial on how to become a successful automotive sales person and is geared towards Automotive Sales Professionals that are new to the business or want to learn needs based selling skills. Imagine yourself as a football player starting your first day at rookie training camp. When you get there the coach tells everyone he does not have a playbook or a game plan. He says, “You are going to go out there and wing it and just PLAY! PLAY! PLAY!” You are going to learn by trial and error in the games and you are going try to win! Now, you and I are not football players, but that is how many dealerships approach new sales training. Many sales people are told to study the product brochures, know your inventory, go talk to that customer on the lot and try to sell them. Daily learning is done by trial and error and after the fact coaching with no real game plan. We all know that is not a formula for success. If professional athletes have playbooks, game plans, practice daily, and scheme for their opponents to win games and become world champions, then why shouldn’t we? 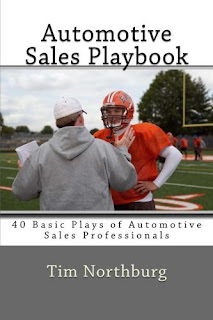 This Automotive Sales Playbook is designed for the new automotive sales person to have a “game plan” and to be able to study the basic and fundamental techniques that will help them be successful from the start. It is 40 quick plays that will help build a customer focused sales process, while helping the sales person take their customers further down the Road to the Sale and to sell more vehicles. Also, this book is for veterans to “remain sharp” and sell more vehicles. With this training guidebook, dealerships can control a majority of their turnover by properly training their sales team, all on a minimal budget. They can send their team out on the field with a written game plan and know that they are going to be more successful from the start. Dealerships can decrease the turnover with properly trained sales staff.